If you've bought or are thinking about buying a video wall display, you've probably felt daunted by the task, but take it from us — it really doesn't have to be a huge production! And, in truth, video walls have become affordable enough for the everyday business owner to own. These dynamic displays are effective and impressive when the right product is arranged in a sharp layout. 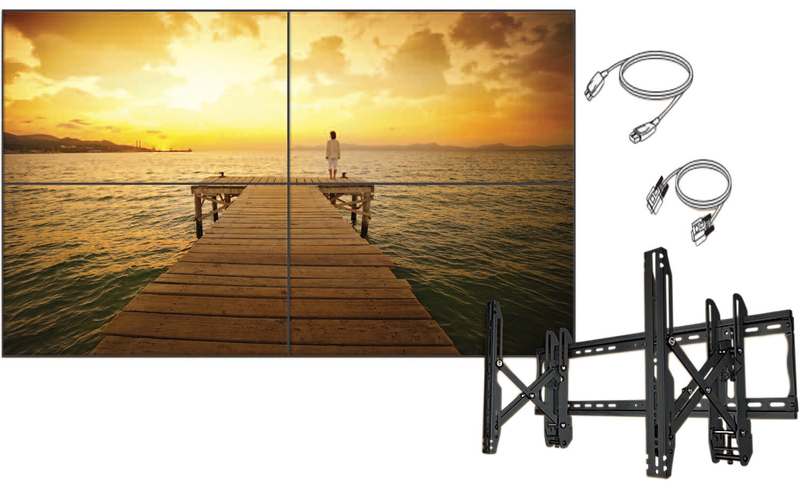 Always follow the manufacturer's user manuals for the specific software and electrical needs for your specific monitors, but before that, you can get started with these 6 easy steps on how to mount a video wall. 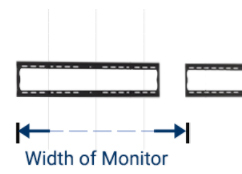 The VESA (Video Electronics Standards Association) size of your TV or Monitor can be summed up as the unique placement of 4 mounting holes on the back of your screen. These mounting patterns were created to establish industry standards to help install bracket accessories on TVs and monitors across the consumer electronics sector. Oftentimes, the VESA size of your screen will be included in the user manual for your model, and can often be found online on the manufacturer’s website, but just in case, here’s a helpful guide on VESA Size & How to Find the Right TV Bracket. You’ll want to measure the dimensions of the video cabinet. For this simply measure the height and width of your monitor to the outer edges. This step will come into play later on when determining the space you’ll need to accommodate the other screens in your video wall. Attach mounting brackets to all of your monitors (or you can do one at a time). At this point, you will want to make sure that your mounting holes are level and that each of the VESA holes are aligned in the same position from top to bottom and on each side. From here you will be able to adjust the angle or position of your screen. If you’re mounting the top row of screens first, you’ll want to tilt your mounting brace upwards to accommodate installation of the row beneath. Tighten the bracket in place so that your screens are securely positioned and to avoid any subsequent drooping of the monitor. Choose your grid style and layout. The most common formatting is referenced as 2x2, 3x3, 4x4, etc. Next, find the optimal viewing height and viewing location for your video wall. 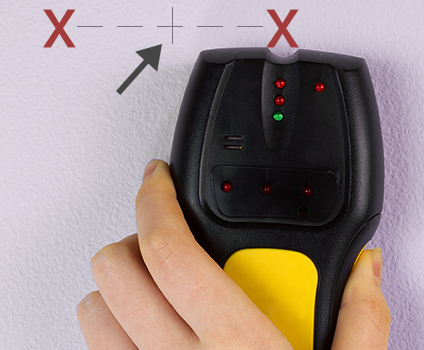 Before you go any further, use a stud finder to find the support studs you’ll be using for a safe installation. When you’ve located the stud, nudge the stud finder out to find the edges of the stud and mark on each side so you can easily identify the center. Mark with an X. Repeat this until you find the center of each stud for the entire area you are mapping out. After you’ve marked your stud locations, you’ll want to draw out where your pilot holes will be. Do this by marking from the furthest edge of your bracket to where your screen will end. (See image below for reference.) Follow the same logic when mounting vertically. Make sure all of your lines are level and then drill out your holes and get ready to mount! Use anchor bolts anywhere that you absolutely can’t find a viable stud. You don’t want this thing falling off the wall! First and foremost, if your monitors are equipped with pin locks, make sure to disengage them, then hang your top row of monitors. Do make sure to re-engage them after each monitor has been mounted. As you hang each monitor, make sure to pivot any screens that were previously mounted to the side or upward to allow installation of the next monitor. Next, level and adjust your screen angle (starting with your center monitor) via the adjustable bracket arms. Secure into place with the compatible tools and any hardware provided. For lower screens you’ll want to employ the extension of the upper screens (if you’re mounting brace features extending arms) and pull out the above bracket for ease of mounting. If you are using a LAN connection (vs. a cloud connection), consider mounting where a compatible port is close by. Secure a powerstrip to the wall behind your screens for close connectivity and easier cord management. Plan for ventilation and cooling. Make sure to give your display enough room for the heat generated by electronics to dissipate and for adequate air circulation. Look up the daisy chaining technique for running HDMI cables , this will be seriously helpful. Here’s a smart video on How to Daisy Chain HDMI to Multiple Displays. You’ll want to look into a good content management system that is compatible with your display. Any electrical work should be done by an expert!